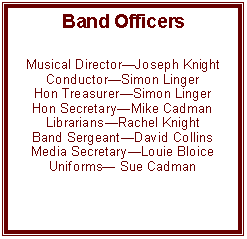 The band has a number of vacancies for players. Please contact the secretary or turn up to a practice with your instrument. If you play any brass instrument please consider Loddon Band. The band needs more musicians , in particular, more cornet players at this time. If you have played many years ago and feel out of touch and would like to play again, we can assist your rehabilitation and provide you with an instrument, a friendly atmosphere in which to start playing again, lots of support, interesting and varied music and some fun concerts to play in during the year. Come along to practice or contact the secretary.